Arrietty Clock is a teenage “borrower” from Mary Norton’s classic children’s fantasy book series, The Borrowers. The borrowers are tiny people who live by “borrowing” everyday items from the Big People, who they call “human beans”. Because of the spirited Arrietty’s curiosity, she and her family end up having far more adventurous lives than the average borrower. In the UK issue of the Japanese animated film Arietty’s World, inspired by the books, Arrietty is voiced by Saoirse Ronan; in the US issue, by Disney actress Bridgit Mendler. Like everything else they own, the borrowers’ names have also been “borrowed”, and used in new ways. Arrietty is reminiscent of the word arietta, meaning “little song, a small aria” in Italian. However, it is also very similar to the name Harriet, and the short form Etty. As Aria and Harriet are quite popular, and Etta very hip, Arrietty is one of those invented names which we are half-surprised wasn’t used before the books’ publication. In J.R.R. Tolkien’s classic fantasy novel, The Lord of the Rings, Arwen Undómiel is an Elven princess, said to be the most beautiful of the last generation of the High Elves. She is the lover of the hero Aragorn, and because she is an immortal, Arwen must sacrifice a great deal to be with her love. In the Peter Jackson films, she is played by Liv Tyler. In the Elvish Sindarin language created by Tolkien, Arwen is said to mean “noble maiden”. However, Tolkien did not invent the name itself, which is a modern Welsh name. It may be a feminine form of Arwyn, which I have seen translated as “very fair, greatly blessed, splendid”. In the UK, the name began charting around the time The Fellowship of the Ring came out, and is currently #654 and rising. This does have a (short) history as a genuine Welsh name, and was given to a very lovely fantasy princess. Bellatrix Lestrange is an evil witch in the Harry Potter fantasy series, the Dark Lord Voldemort’s most faithful follower. In the films, she is played by Helena Bonham-Carter. Bellatrix was born into the Black family, and like all members of that clan, she is named after a star. Bellatrix is the common name of Gamma Orionis, a bright star in the constellation of Orion. Its name is Latin for “female warrior”, which was originally given to Capella, and then transferred to Gamma Orionis. It is also known as the Amazon Star, a loose translation of its Arabic name, which means “the conqueror”. Bellatrix Lestrange’s name is apt because she is a skilled warrior for Voldemort, and has won many duels. This name sounds very usable, because it has the popular Bella in it, and the -trix from hip Beatrix. However, while the Harry Potter character has raised the name’s profile, it’s also a stumbling block, because the character is evil – and not in a cool “strong yet misunderstood woman” way. Bellatrix is a fanatical racist with a love for murder and torture, and a starstruck Voldie fangirl with an annoying little-girl voice. So on one hand: great name. On the other: horrible association. 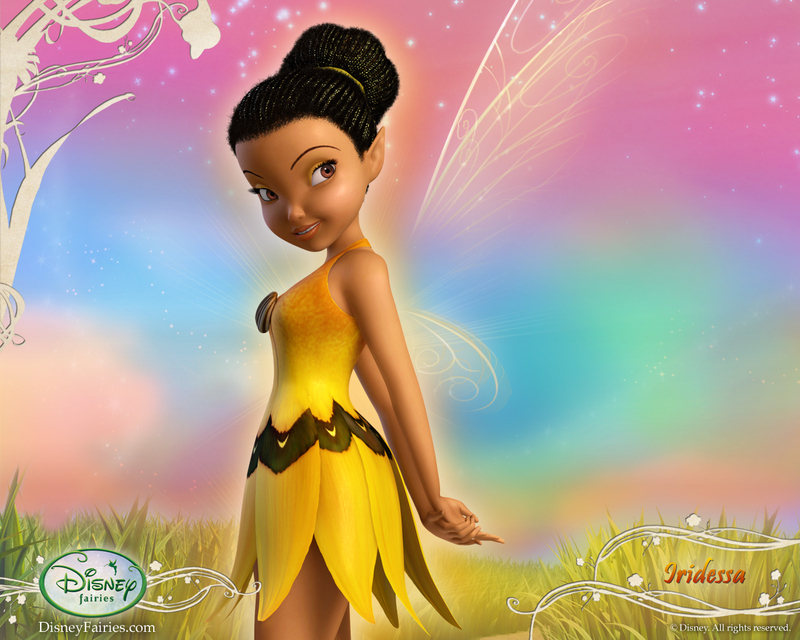 Iridessa is the name of one of the fairies in the Disney Fairies franchise. Her talent is working with light, and she wears a yellow dress, lives in a sunflower, and has clear fairy wings. In the movies, she is voiced by Raven-Symoné. Iridessa is a perfectionist and a worrier; she likes to look on the bright side of things, but can usually sense trouble approaching. When disaster strikes, she rushes in to save the day, and brings sunshine, light and brightness to every situation. The name Iridessa seems to be based on the word iridescent, meaning “producing rainbow-like colours; brilliant, lustrous, prismatic”. The word is derived from Iris, the name of the goddess of the rainbow, so you could see Iridessa as a modern spin on the older name. I have seen a baby with this name, and it’s been frequently Googled, so it seems that people find the name of this fairy intriguing. It’s not surprising, with such an attractive namesake associated with light. Looking for a nickname? Iridessa goes by Dess. Khaleesi is extremely unusual as an invented name, because it is not the name of a fictional character, but rather her title. In George R.R. Martin’s fantasy series, A Song of Ice and Fire, khaleesi is the word for the wife of a khal or ruler, in the Dothraki language from the novels. The Dothraki are a nomadic indigenous people without a written language, so the spelling of khaleesi in the novels must come from another culture. In Martin’s novel series, shy Daenerys Targaryen adopts the title of Khaleesi when she weds powerful Dothraki warlord Khal Drogo, and as his queen, grows in strength and confidence, becoming a leader in her own right known as “the Mother of Dragons”. In the television series based on the books, A Game of Thrones, the role of Daenerys is played by Emilia Clarke. Since the television series began airing in Australia, there has been a spike of interest in the name, with about 25 baby girls called Khaleesi born this year. For some reason, the name is far more popular in Queensland than elsewhere – possibly because of the connection with queens. The Lorelei is the name of a famous rock on the River Rhine in Germany, and also the name of a beautiful water sprite or siren associated with the rock, who is supposed to lure men to their doom. More prosaically, the current of the river is very strong here, which explains the many accidents which have occurred in the area. The character of the Lorelei comes from a 19th century German ballad which poet Heinrich Heine turned into a poem called Die Lorelei, where a golden-haired siren unwittingly distracts men with her beauty so they crash onto the rocks. The poem has often been set to music and turned into songs, and is part of German popular culture. The name Lorelei is a combination of German dialect and Celtic, and means “murmuring rock”. Lorelei is the name of the alluring blonde in Gentlemen Prefer Blondes; in the film she is played by Marilyn Monroe. The name also features in garrulous gabfest Gilmore Girls, where both mother and teen daughter share the name Lorelei (the younger goes by Rory). Comedienne Kat Davidson named her daughter Lorelei “Rory” this year. Said LOR-uh-lie, this is better known in the US, where it is #531. Pollyanna Whittier is the title character of the Pollyanna books by Eleanor H. Porter; the series was continued by a number of writers. Pollyanna is an eleven-year-old orphan who is sent to live with her Aunt Polly in New England, and her sunny disposition soon teaches her stern relative, and the whole town, how to play the “Glad Game” – where you always look for something to feel glad about. While many are charmed by the heroine’s upbeat view of life, cynics find her too syrupy and her philosophy simplistic. Because of this, the word Pollyanna has entered our language to mean someone optimistic to the point of naivety or refusal to face facts. Pollyanna is a combination of Polly and Anna – Polly is a medieval variant of Molly, a pet form of Mary. This would be a difficult name to give a child in many ways, but would make a sunshiney middle, and easily shortens to Polly. Rogue is a character from the X-Men Marvel comic books created by Stan Lee and Jack Kirby. She is one of the team of mutant superheroes under the auspices of Professor Xavier, who recruits and trains young mutants to use their powers for the benefit of humanity. Rogue considers her special ability something of a curse, as she involuntarily absorbs, and sometimes removes, the memories, strength, and superpowers of anyone who touches her. For most of her life, she limited her physical contact with others, even loved ones, until after many years she was able to gain full control of her abilities. It was eventually revealed that Rogue was a code name, and her real name Anna Marie. In the movies, she is played by Anna Paquin. A rogue is a scoundrel or rascal. More to the point, a rogue animal is one which separates itself from the herd, and in horticulture the word rogue is used to describe a plant which has an undesirable mutation and must be destroyed. Anna Marie seems to have chosen Rogue as her code name to express her bitterness at the biological difference she had been lumbered with. This name can be used for both sexes; I saw it on a baby girl last year. Scarlett O’Hara is the protagonist of Margaret Mitchell’s best-selling Civil War novel, Gone with the Wind; in the film version she was played by Vivien Leigh. Slender and attractive, Scarlett is flirtatious and charming, but doesn’t fit the mould of a typical Southern Belle. Smart, feisty, stubborn and very strong-willed, she nevertheless is inwardly insecure. What makes Scarlett such an interesting character are her many flaws – she is vain, selfish, spoiled, unscrupulous and manipulative, but hard as nails, with an overpowering survival instinct. Scarlett is an English surname from Norman French, referring to someone who dyed or sold brightly-coloured cloth, which was often red. It has been used as a unisex name since the 17th century, but is now usually thought of as feminine. The character’s full name is Katie Scarlett O’Hara, and she was named after her grandmother. Margaret Mitchell originally planned to call her heroine Pansy, and changed it to Scarlett just before the novel went to print. Scarlett first ranked in the 1990s at #467, the decade in which American actress Scarlett Johansson made her film debut. It climbed precipitately to join the Top 100 in the mid-2000s, and is currently #25 nationally, #23 in New South Wales, #17 in Victoria, #33 in Queensland, #17 in South Australia, #22 in Western Australia, #21 in Tasmania, and #26 in the Australian Capital Territory. Velvet Brown is the heroine of Enid Bagnold’s novel, National Velvet, about a teenager who rides to victory in the brutally difficult Grand National Steeplechase, the most valuable jump race in Europe. The story is about the ability of ordinary people to achieve great things – Velvet is a plain, rather sickly girl from a working-class family, and the horse she wins on is a piebald. The movie version chucks most of this inspiring message aside so they can show a radiantly pretty pre-teen Elizabeth Taylor galloping about on a chestnut thoroughbred. Velvet is a fabric which was originally very expensive to make, and therefore associated with nobility and royalty. The word is from Old French, and comes from the Latin for “tuft, down”, because of velvet’s distinctive texture. It has been used as a name since the 19th century, and has been given to both genders, but mostly to girls. This unusual fabric name is warm and luxurious, perhaps even rather sensual. POLL RESULT: People’s favourite names were Lorelei, Arrietty, and Scarlett, and their least favourite were Rogue, Pollyanna, and Khaleesi. Arwen is my 8 month old daughter’s name! We chose it mainly because it was the only name my husband and I could agree on. We’re both Tolkien geeks and we liked the meaning. So far, it fits her perfectly and we’ve had several compliments on it. It’s made us realize how many people aren’t familiar with LOTR though. Most people just think it’s a very odd name, while there are a few who get so excited by the association. I think a lot of people worry about using a name which is strongly associated with a particular fictional character, but as you’ve discovered, there’s only a narrow range of people which actually know about the name (and LOTR is a very famous best-seller, and the LOTR movies were huge blockbusters and won tons of Academy Awards, so it’s not obscure at all). Arwen strikes me as a pretty name which isn’t too frilly and is uncomplicated to pronounce; I’m a bit surprised some people find it odd, when it’s similar to other names, like Aria, Arden and Bronwen. I live in the southern US, so that may have something to do with people thinking it odd and the majority not recognizing it as a Tolkien character name. We do come across the occasional nerd like us who flips out over it. It’s actually helped us connect with some people, one being my uncle who was so excited when he heard her name. He told us that he watches the movies a couple of times a year. We had no idea he was a fan as well! How lovely that your daughter’s name helped you form bonds with other people, including your family! Obviously you can’t cover all possible literary/movie namesakes in one post, but what about Liesl? She is the main character in The Book Thief, a great book about to turn movie, and it has a lot of the same sounds as more popular names like Elise and Leah. I’m going to do names from Australian fiction in another post next year, and I will add Liesel to the list. I actually thought I’d already done that name, but when I checked, I replaced it with Lisbeth. Iridessa is sweet I’ve loved it since I first heard it a few years ago. I do like Pollyanna even though I prefer Mollie to Polly and I don’t like Anna.and Velvet and Rouge aren’t names to me. Khaleesi is ridiculous as is Bellatrix. Arwen’s alright and I struggle to pronounce Lorelei and Arietty is too Harriet-y. The two Scarlett’s only one of them had the name when it was top 100 one is my age the other is four. Arrietty is my favorite. Iridessa is so pretty and intriguing! I also like Lorelei, Scarlett, Arwen and Rogue! Ooh, I especially love Iridessa! Nickname Dessa is so cute. Velvet and Rogue are also pretty intriguing, although I’m not sure I’d use them as first names personally.